Every afternoon around three o clock my children come bounding in the door from school. Back packs and jackets don’t even have time to find a proper resting spot before words just start spewing from their lips. Hey Mom, Quit Bugging Me Mark, My Day Was Cool, You Will Never Guess What Happened Mom and If I Don’t Eat Something Immediately I Will Shrivel Up And Die…are the most popular topics of late. Last week I told them I was going to make a list of Healthy Snacks and tape it to the inside of the pantry door, just to ease the after school hunger issues we are having in this family. 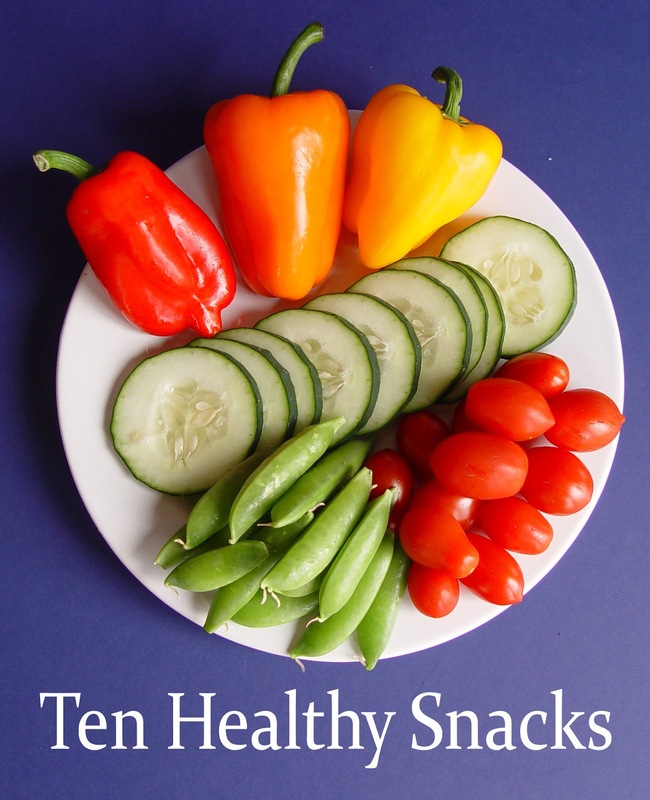 I pondered for a while and came up with a list of our top ten yummy and healthy snacks. I thought you might like to take a little look, this being a food blog and all. 🙂 I’ve made a printable version at the end of the post as well so I can tape it to the inside of my pantry and just in case you want to tape one to the inside of yours own as well. May the force be with us, right? 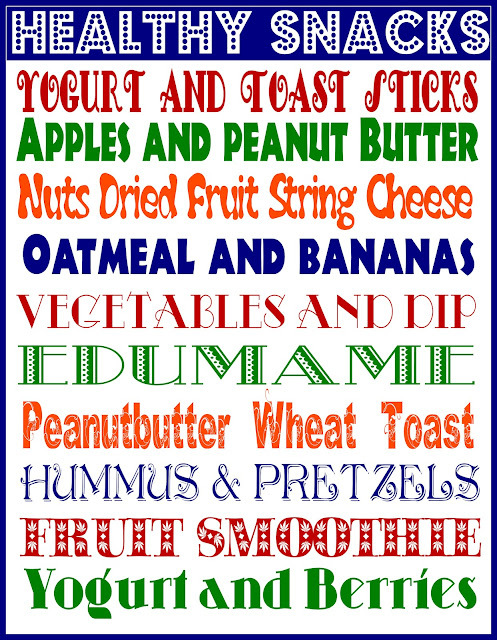 We prefer crunchy peanut butter around here, as well as Fugi, Gala and Golden Delicious Apples. Cinnamon Roll Oatmeal is one of my kiddos favorites. You can of course put any kind of fruit in it, mixed berries is another of our favorites. This has recently become on of my favorite snacks. However, when my daughter Emily saw that is was going on the list she informed me that she hates it, will always hate it and wants everyone reading this post to know that she hates it. I kept it on the list because I’m hoping she’ll find it in her heart to one day get on the hummus lovin’ bandwagon. So, there you have it. Some of us love it, some of us hate it. fabulous with grapes and watermelon. This is not a lie. I could eat this every day, for the rest of my life. We enjoy smoothies made with frozen strawberries, blueberries bit of milk, a fresh banana and about half a package of Crystal Light Raspberry Ice flavor. I’ve found Costco to be the best place to stock up on yummy veggies. The mini peppers, snap peas and grape tomatoes are all items I like to keep on hand. My kids love them plain, or with this light Zesty Italian. My kids think this is kind of like a dessert. Let’s let them continue on with that thought, okay? I’m not sure why this combination works, but it does. The crunchy nuts and sweet fruit are a yummy duo. Round it out with a little string cheese and your tummy will stops its rumblin’. I’ve found Costco to be the most cost efficient place to buy this yummy snack. If you haven’t ever eaten Edumame before, be aware that the pods are not for eating, just the yummy soy beans inside. Hope you found something to love. new recipes lay in wait. This looks great & I'll provide this for my boys for after school (one is quite addicted to ramen!) But, being a somewhat clueless girl & a smoothie novice – could you provide maybe some specifics regarding the smoothie, i.e. how much of each. I told you I'm really clueless! P.S. It's not that I'm that clueless, I just spend too much time working not making smoothies! I agree, some smoothie basics would be really helpful! Mmm, the beautiful photography helps to sell the healthy snacks too; afterall, you eat with your eyes first. I was never a huge fan of hummus until I found a brand that made a really creamy version with black olives. Now I have a problem of stopping at half of the package. I have also been buying a low fat version of tzaziki (I have probably spelled it incorrectly) but it is a delicious yoghurt with cucumber and garlic dip. Regarding the smoothies, try using frozen bananas for an extra creamy smoothy. If you don't put in much liquid, it is almost like soft serve. Healthy eating never tasted so good! Indeed healthy, I wont get tired of eating a diet like these everyday.